This page details how to replicate the process of adding authorized user groups to Member Management and the domain. This is how access is controlled to the ShopBot and laser cutters. An Organizational Unit exists in the domain that contains an Authorized security group, an Authorizer security group, and the computer account for the device in question. A group policy is applied to this OU that specifies who can log on and who has elevated privileges. 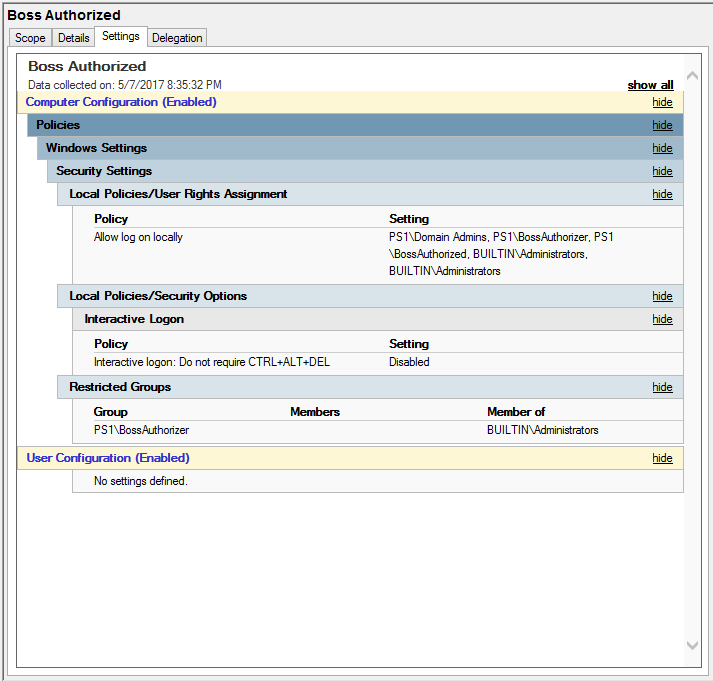 The Authorized security group is what Member Management adds authorized users to automatically. The group policy on the domain grants Authorized and Authorizer users the ability to log on, and grants Authorizers administrative privileges. NOTE: Now is a good time to add all Authorizer (likely danger committee users) to this group. Enter the Member Management Django backend, and select "PS1 Groups" under "Accounts"
Here is an example of how the GPO should look. To finalize the changes, it is recommended you reboot the affected computer, or run "gpupdate /force" from a command prompt. This page was last edited on 7 May 2017, at 20:46.